Got laser running on my printer finally !!!! What can cause this ? Not enough power? amperage? ... TTL is a binary mode - only suited for ON/OFF. So it seems, you have a "binary" TTL input and have to control the power ratio by PWM (Pulse-Width-Modulation) - so the driver is set to the max. power and you'll reduce the average power by changing the PWM ration to a lower value -- e.g. 100% power with a 300µs PWM-periode is a power ratio of 295µs ON : 5µs OFF ... and 10% power ratio will be like 30µs ON : 270µs OFF. 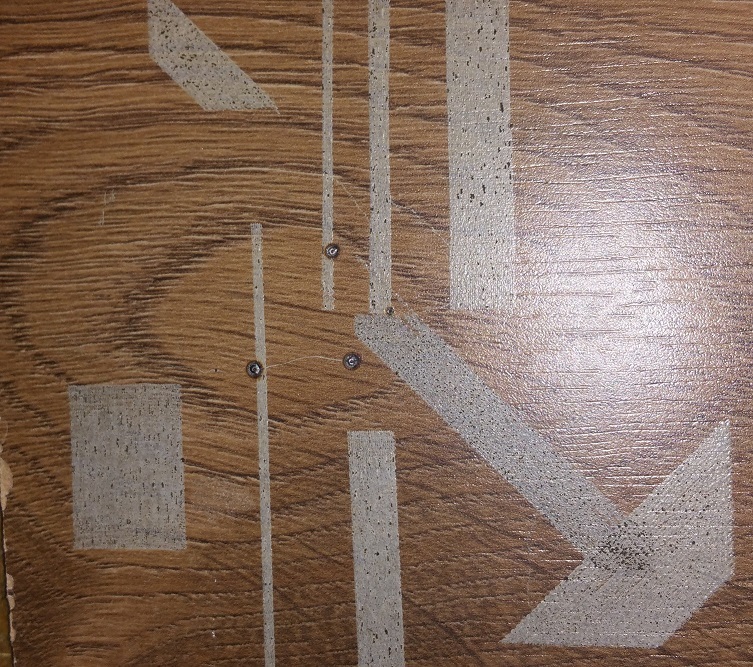 As far I understand that TTL Do laser ON/OFF right? So as far as I understand is that when TTL is on 127 I would expect laser to be at 50% power? im correct? For changing the power you have to add PWM capability to your output. So now I start to se light in end of the tunnel !!! So on image2gcode I need to input "threshold-level" as minimum and 255 as maximum? Edited 1 time(s). Last edit at 08/30/2016 10:24AM by rastaman46. ... your minimum is 0 (or <=204), your maximum is 255 (or >204). Is that me missing something here or its jus G-code not right? Edited 1 time(s). Last edit at 08/30/2016 03:41PM by rastaman46. i believe the problem is with the gcode here. try some simpler gcode to test. 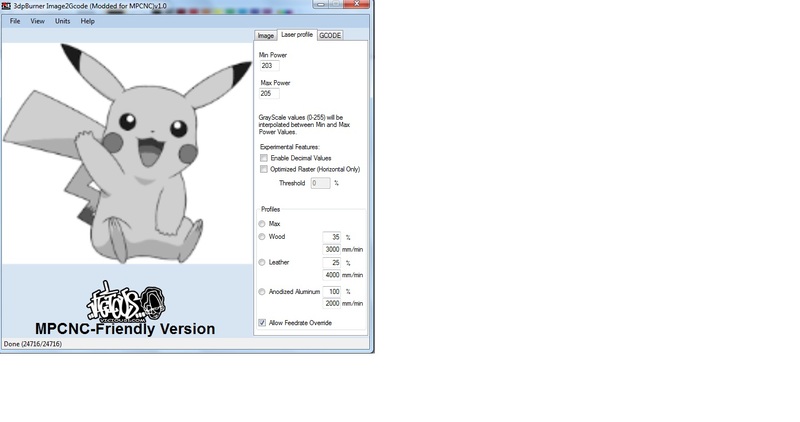 drawn as vector should be better, but if u would try with image based software, try it with binary image, only white and black pixels, no colors, no greys. ... I can't correlate the burnt traces to the image - can you post a piece of your G-code, to see, what is sent to the firmware? If your laser-driver has only binary TTL-input, it can't handle analogue voltages, but it should burn the black areas in the image, as they will give values above the threshold voltage. Can you measure the output voltage and/or the pulses with a scope or DSO? I don't have Scope or DSO. ... could be, you're driving your laser not with TTL, but by switching the power ON/OFF, what's normally a really bad idea! If the solder pads labelled [T+] [T-] are the TTL-input, then you should control it here with connecting GND to [T-] and your +5V-PWM-output to [T+]. So what would best approach to deal with it ? 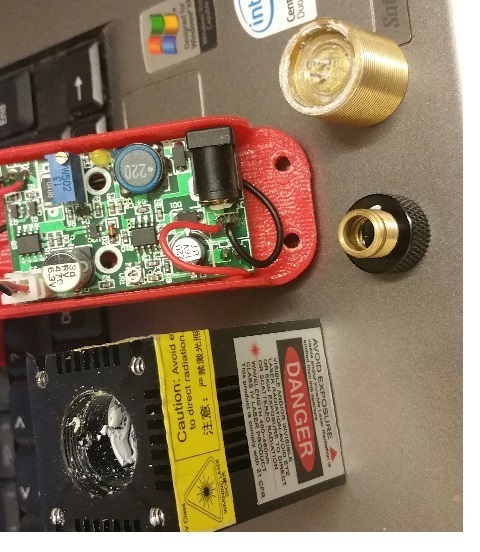 Remove electronics an use 12V laser Driver ? It appears that you just have a laser head? ask seller to sell you a driver for laser. forcing the diode supply ON / OFF NOT the way to do it. It could be, this "2.1/5.5V DC" is the used TTL-level -- below 2.1V it would read LOW, above and to max. 5.5V it would read HIGH ... and above 5.5V it will burn. so all it is if i apply 12v to it it come on so that means T+ and T- do nothing i wouldn't expect laser to fire before T+ is 5V right? ... try to identify the circuit - if there is some means of controlling, then you need the correct specs and input values. If it's only a constant current (CC) module, the the T+/T- inputs will do nothing - but then, if it's a simple CC, you can switch the 12V with an external 12V driver, as if it were a TTL input. and i have attached picture with all i got left can i make something with it or i need to buy some more stuff?? ... the previously "embedded" module seems to be a simple constant current driver, without any other controlling option. Was this driver with your lased-head? 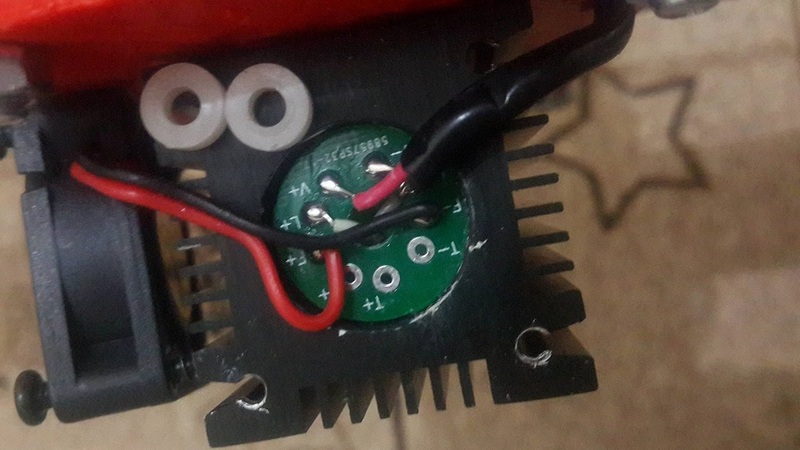 ... on second thought -- could it be, that the "embedded" module is only the driver for the fan, and the laser-diode is only connected to the bigger external circuit? Then this would be the typical assembly and the TTL-input is on the external module, not on the T+/T- pins inside the laser-head. 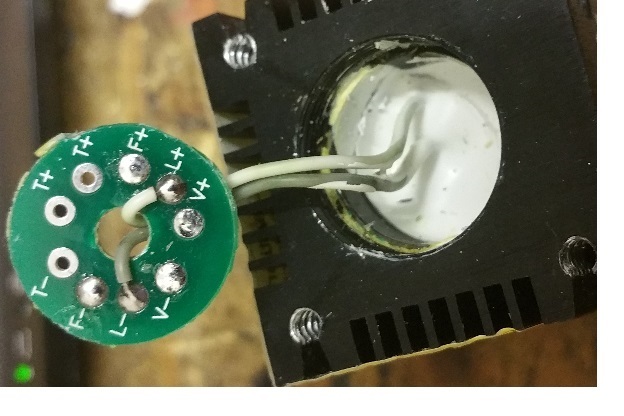 If so, then all laser power controlling was done with the external module and the laser head isn't running with 12V, but with around 4V and the current set with the blue potentiometer. Where was the board in laser driver pix located? 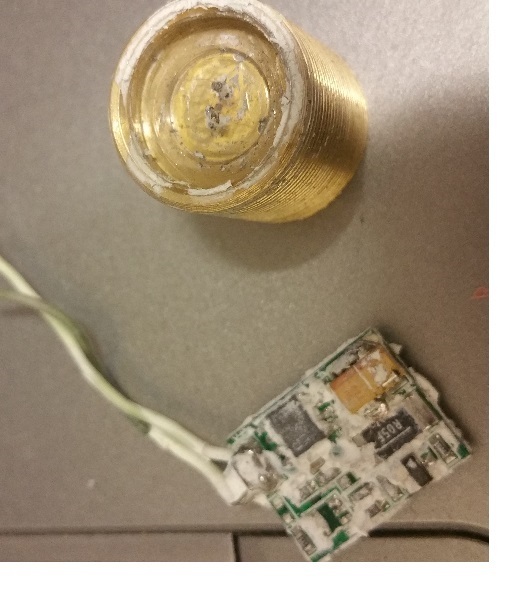 What were grey and white wires connected to? Where did circuit board on red plastic mount come from? was in box you never unwrapped and used? The last one is your laser driver. The one with a trimpot and a big inductor. Mine is the exact same. Mine does the exact same behavior when controlled via "standard" PWM from an Arduino. The problem is simply that you are running the TTL input too fast. You can't switch at the "standard" speeds that your Arduino controller outputs. If it goes too fast for the TTL input on the driver can't keep up. It is very possible that you can't get the switching speeds that you want in the end. It is my impression that our Chinese friends have designed this "TTL" input to be for controlling the laser On/Off only- So not for use for dimming while burning. It is actually good that it has this feature because otherwise you have to cut power when turning On/Off and that has all sorts of bad effects on in-swings and so forth. This is as far as I have gotten (determined why TTL will not work). BUT I have abandoned that project. As it happens, I have connected a device to measure current (A) from that Chinese driver and it is really bad. Fluctuating +-0.1A easily. While for pure burning that doesn't matter much , it does matter a lot if you want to control the exact dimness. So the fact that the driver can't keep stable current and it can't work fast TTL kinda tells me this is not the driver you want to use for exact dimming operations. Edited 1 time(s). Last edit at 08/31/2016 10:37PM by LarsK. Hmm, my post sounded very negative. Double sided PCB for installation on my hot-end with power and Ethernet cable for signals. All made via VDX etching method and our Chinese laser driver using the TTL signal to control when it is burning or not. M42 P11 S255 and S0 respectively. I have purchased this [www.aliexpress.com] separate to run on TTL that what seller refer me to.That why I got lost on this could not get it to work. Can I use this driver to drive diode now? or I need something different? Your laser-head was previously only driven with a CC-driver (constant current) - but the 2500mW is not so clear either - there are actualy 445nm-laserdiodes with 1W, 1,6W, 2W, 3,5W and 6W available. Your big driver is the corret one for TTL-driving. Before connecting it to the diode, you should define the correct current level. For this you must ensure, which laserdiode you have - either a 2W-diode with 1.7A max, or a 1W-diode with 1A max. Then you connect the laserdiode-output to a 5Watt-resisitor with 0,1 Ohm and adjust the current through the resistor to the max. current you want drive your diode with. Edited 1 time(s). Last edit at 09/01/2016 04:48AM by VDX. This is extremely helpful now much clearer. How do I identify diode ? how can I tell is it 1W or 2W? Say if im not sure about Diode wattage yet if I set it to 1A to be safe ? And voltage where do I start ? 3.3V? to max 5V?